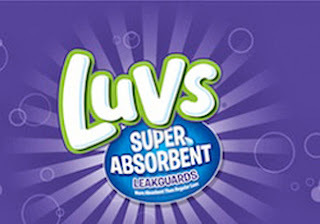 Luvs has a new line of diapers out that are 15% more absorbent than regular Luvs. These Luvs Super Absorbent diapers, exclusively found at Wal-Mart, have a special BLUE seal on their packaging to make them stand out. I was sent a package(well 2) of the Luvs Super Absorbent with Leakguards to test and review! The program was called the #TheClueisintheBlue program! This was one of the best programs that I have been a part of! One of the most expensive things to have to buy for our little ones are diapers! When you purchase diapers you want them to work well and not leak! Well LUVS is what you need! They are great priced too! These Luvs diapers are AWESOME!! They are very absorbent and trap leaks so that there is no mess to worry about! I shared these diapers with my little neighbor! His mommy luved them. She was use to buy the diapers that were on sale or the cheapest she could get her hands on, well now made the change to LUVS! She and I give then an A+! The best things about LUVS is the price and that they dont leak! That makes then a great diaper for any busy little fella! Disclosure: This is a sponsored post for SheSpeaks and Luvs. However, the views above are my own opinions.